In this case study we examine the explainer video for Inbenta, a natural language processing service operating in a highly competitive search engine market. Requiring a video that could speak to a variety of audiences, including potential clients and investors, Inbenta wanted an animation that was fun, yet professional. 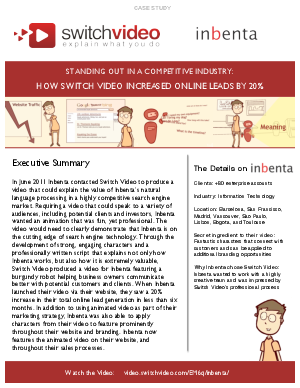 Through the development of strong, engaging characters and a professionally written script that explains not only how Inbenta works, but also how it is extremely valuable, Switch Video produced a video featuring a burgundy robot helping business owners communicate better with potential customers and clients.